left over from Square's better known titles. 2014 might be the time. This is not the entry I spoke of earlier, this is rather the second part of the Year Three update. Like I said, no essential Q&A to be had, but one thing I wanted to address was the future. What can be expected from this blog in 2014? 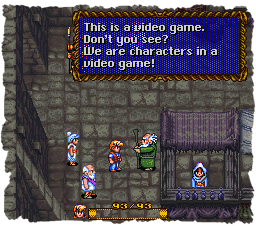 Well, as I kind of hinted earlier, I'm going to focus on RPG's a lot more - not just during this RPG Time!, but generally. I'm also going to primarily focus on retro like I have often promised and honestly aimed to do. Why? Because it's high time that I finally review some individual games that I feel are worthy of a Top 60-sized shot. Yeah, there are still many left. I'm also going to keep tying up those loose ends, both major ones like totally missing parts of marathons, and some odd games that might've come to my attention only recently, or notably different alternative versions of already reviewed titles, notably enough to be worthy of a second look. Come this year's final releases that'll keep me locked in good for a time each - Grand Theft Auto V, Assassin's Creed IV, and the new Batman game (I refuse to say its name, 'cause it makes me chuckle, the game looks and sounds great though!) - some changes will happen. I already have a new retro look in development for the blog, also inspired by fantasy video games of the 80's and 90's. It's not all about RPG's, I'll have you RPG-haters know. There are plenty of old quality games from whole other genres which I have left in the dark for way too long. Just the thought of finally reviewing some of the best games of my childhood isn't quite enough. The biggest reason for the upcoming change is the console market's transition to the eighth generation, which will happen by the end of the year as I'm sure all of you are well aware. I've never bought a console fresh out of the oven - this time I'll do it, but I'm not completely certain if I'll get any games for it right away. Maybe just one - I'm more interested in how the PlayStation 4 basically works on launch than its gaming properties, 'cause let's face it: they can't do much better, not anymore. Besides, every single game I have great interest for - both "parts" of Metal Gear Solid V: The Phantom Pain, Dragon Age: Inquisition and Ubisoft's new bombastic IP Watch_Dogs - is coming out on the PlayStation 3 and Xbox 360. I know some stubborn kids think the "newer" versions of the games are the true ones, and stripped versions are just given to us geezers in a fit of pity. They're going to be the exact same games; OK, the new consoles are sure to have slightly better graphics, a better framerate, all that, but they have the exact same gameplay content, and they play out exactly the same. No reason for me to get all hell bent on starting my PS4 collection right away. Besides, I have principles: I cannot buy Assassin's Creed IV for a Sony console since I have all the other games for the Xbox. As I long as I have a choice in the matter, I'll damn right invoke it. The only game I might be getting for the PS4 instead of the PS3 or 360 is Watch_Dogs, simply since it's a new IP, therefore a good start for a collection, and in its fancy nature a decent showcase of the eighth generation's power, I think, despite coming out on "older" consoles as well. Long story short: some sort of break from totally new games is coming at some point anyway, so let's take advantage of the situation and play some older games for a change. Good ones, too; I have used words like "utterly", "horrible", "unplayable" and "abysmal" way too often lately.